I tried yesterday to extract as image + cue sheet this various artists CD: "Songs in the Key of X". Before index 01 are two hidden tracks. Track 01 starts at 09:12:25. My drive is a brand new Plextor 740A (the BenQ one). In EAC, for this kind of job, you have a choice between extracting an image or use the "copy range" command. I ripped as an image and the file lenght was correct. Problem is... I have 9'25'' of silence before the 1rst track. No music. To be absolutely sure this has nothing to do with overreading ability, I checked the option (I left it unchecked because the 740A can overread in lead-in, but not in lead-out). New rip, same result. Only silence. Then I tried to uncheck the "Fill up missing offset samples with silence". I know... there's absolutely no reason this should interact. But I had to try. Result: same thing. Only silence. Note: during each rip, the 1rst row of red squares was lit, very quickly and without stopping during these dreaded first 9'25''. Then no errors at all for the rest of the rip. I tried the PTP. Since you can't extract as an image with the standard version, I downloaded the trial version of the infamous Plextools Pro XL. Well... I had a fatal error as soon as PTP did the gap detection. Is the ability to correctly rip music before the index 01 hardware-based? If so, what feature is it? Where do we look for in the specs before buying a drive? I have an LG 8526B 52x CDRW that shows up in EAC as HL-DT-STCD-RW GCE-8526B. The EXACT same thing happened to me a week ago when I tried to rip Blind Melon - Soup with a hidden track. I tried my Sony 24x cdrw laptop drive which I think is just a rebranded LiteOn and all was well. I guess either your drive can do it or it can't. I have an LG 8526B 52x CDRW that shows up in EAC as HL-DT-STCD-RW GCE-8526B. The EXACT same thing happened to me a week ago when I tried to rip Blind Melon - Soup with a hidden track. I tried my Sony 24x cdrw laptop drive which I think is just a rebranded LiteOn and all was well. I guess either your drive can do it or it can't. Weird, isn't it? I mean... optical drives have been tested for DAE for years now. Cache or not cache, overrreading or not, offset etc. Hundreds of pages were written on the best way to have a bit exact copy. I can't believe such a feature could have been overlooked. Never knew there was a hidden track in the pregap of Soup. Guess I'll have to go dig out the cd now. With EAC you can copy the pregap tracks if you use the setting "Append Gaps to Next Track" or just copy"index based". Unfortunetaly this does no good for image ripping or ripping with normal gap settings. I've requested many times an option to rip track 1 pregaps as track 00 and be properly appended in the cuesheets while still using the normal gap method. Still not there though. My only suggestion is to find the topic on the EAC forums and voice you opinion too. I get the same error detection and silence results with you too (Less Than Jake - Losing Streak). I guess it is hardware dependent. But could someone in the know clarify if it's a physical inability to read this area or if the drive just 'thinks' it's out of bounds because of the TOC and so doesn't even try? Basically, how does overreading work please? Actually, though I understand your concern et agee with you, this is not really the problem exposed here. EAC can extract the pregap with the default setting, minus the first two seconds. I can live with that. I don't have a problem with EAC or even the Plextools Pro, I have a problem with some drives. What is your drive model? I'm going to list them in the first post. I'm thinking more and more of a firmware feature. The ability to "rewind" in the pregap could be firmware-based, isn't it? Or am I silly? I may be wrong, but the thing about the hidden track is, thats what I thought, simple: They simply put the cd start marker at a later position than the real cd start. So I guess there should be no technical reason not to read this. Exactly. That's why I'm thinking of a firmware limitation. That's why I thought this had nothing to do with overreading. Thre's another inconsistency: the rip is fine with the 712A and the "Overread into lead-in and lead-out" option unchecked. I've asked for this question to be cleared up before. Hopefully Pio2001 will return and enlighten us. I bought a Plextor PX-W5224A specifically to rip these tracks. I bought it as it can over-read the lead-in, and it appeared to me that this was the requirement. If you are compiling a list, my Samsung SD-616E at work managed to rip Bloc Party's Silent Alarm (whereas my Lite-On SOHW-832S and Toshiba SD-M1502(?) wouldn't even get past gap detection) but the INDEX 00 track was silence. MY Plextor is working well for the role. If I have understood correctly, when the read offset correction is set in EAC to read from lead-in area it just adjusts the physical starting point a bit. This two-track disc has indentical audio content, but the disc starts with a huge 45-minute hidden track. The difference between these two discs is only in the table of contents, not in the physical location on the disc. EAC says the Sony CRX830E can overread into lead in and hidden pregaps rip fine. Thanks. I updated the list in the first post. Your test with the LG 8526B and the contradictory statements in EAC are weird. Could all the overreading detection tests be flawed and inaccurate, be it CDSpeed or EAC? Now that's a disturbing idea. Edit: maybe a stupid idea. Could the overreading ability be limited with some drives to x samples and no more? That could explain the 1rst detection in EAC producing a positive result (yes, this drive can overread in the lead-in...), then a negative one with a hidden song (... but not this far, silly ). I was actually going to reply with this earlier. 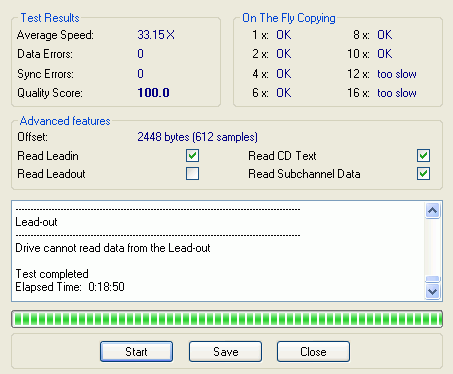 I did the CD Speed test on my Lite-On a while back and although the report may say that it can read lead-in I believe the number of samples was small - equivalent to 1-2 seconds or so. We may be on the right track, there. Now how do we know how much samples in the lead-in can a drive overread? The various DAE databases are useless. That's something nobody ever cared to consider, TMHK. I'll try to get figures from CDSpeed for my Lite-On and Plextor in the next few hours. That may be interesting - to see how large the difference is. I just ran CDSpeed on my 712A but no test of overreading was done. I guess you have to do the "Advanced DAE quality test" which requires burning a CD? I searched for information and it seems that all audio data is always physically located after the lead-in area, including the data in the pregap before the first track. I was curious enough to test how this works. I burned a test CD-RW with a hidden track. I used a modified cue sheet and a standard wave file. The CD works fine. The hidden track can be accessed by rewinding on my stand-alone player and also EAC can rip correct disc image wave & cue files that contain the hidden track area. I used LG's HL-DT-STRW/DVD GCC-4080B drive and EAC v.0.95b3 for burning and ripping. My BCD E520C CD-ROM overreads into lead-in/out, and can rip it fine. Lead-in : can't be played back by any drive, but nonetheless features some audio frames, as a buffer. At the end of the lead-in, the audio track begins. This point is Track 01 Index 00, and the absolut time is 00:00:00:00. Then, there is a compulsory pregap, that is two seconds long. The end of this pregap is only materialized by the numbering of the audio sectors. The absolute time is then 00:00:02:00, and the audio sector is number 0. From this point, CD Players can playback (as long as you rewind first in order to reach it), and DAE programs can extract "by range" (from sector 0 to sector xxxx ; There are 75 sectors in one second). Then, after a possible hidden track, the track 1 begins. This point is Track 01 Index 01. The absolute time and sector number can be as high as we want. From this point, CD Players automatically start the CD playback, and DAE programs extract "by track". In some cases, you are forced to overread into the pregap. In the two CD with hidden tracks that I've got the audio actually started in the pregap, and it was not possible to get the beginning "by range", or "index based". The extraction starts 2 seconds too late. (they are Elegia - From within, and a CD by Juantrip whose title I forgot). There is also a problem with Mike Oldfield - Discovery, but this one has no hidden track. It is the track 1 that begins too early ! And no way to rewind on the CD Player, not to get the missing part "by range". The solution is to set the read offset correction to a very low value. But since EAC doesn't accept values low enough, it must be done directly in Windows registry, in the EAC setup. Then start EAC, and rip without displaying the drive options. Could there be some kind of difference between the factory made hidden tracks and the ones made with EAC? TITLE "Merry Christmas and Happy New Year"
TITLE "Little Drummer Boy/Silent Night/Auld Lang Syne"
TITLE "Little Drummer Boy/Silent Night/Auld Lang Syne (Extended Version)"
TITLE "Hidden Track & Three Little Bears"
Yes. You create the test CD and then run the test (Extra > Advanced DAE Quality Test). Curious results. Strangely enough, CD-DVD Speed also reported the offset of the Plextor as 0 bytes/samples. I may need to try the Lite-On with a hidden track again to double-check. Thanks a lot to Pio2001 for the comprehensive response. I'm hoping that I may even be able to understand some of it with a clear head tomorrow morning.